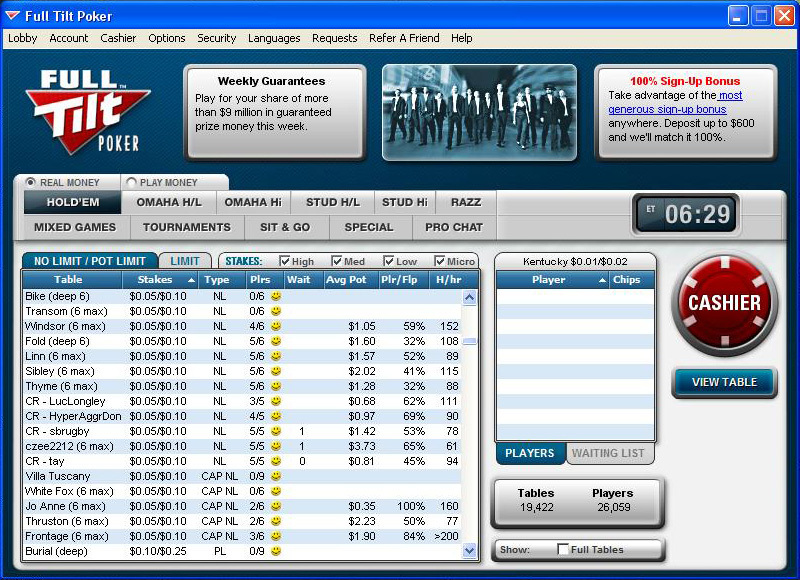 Full Tilt Poker is one of the biggest and most famous poker sites on-line and with its great features, games and team of professional players, it has all the reasons to be one of the best around. The interface is very clean, warm and welcoming to new players. The menus are easy to use and there is always a table of contents to explain everything you need to know on the main screen. Full Tilt Poker guarantees $8 million prize money each week, it accepts players from all over the world, including U.S. players, and it is more than easy to use and enjoy. 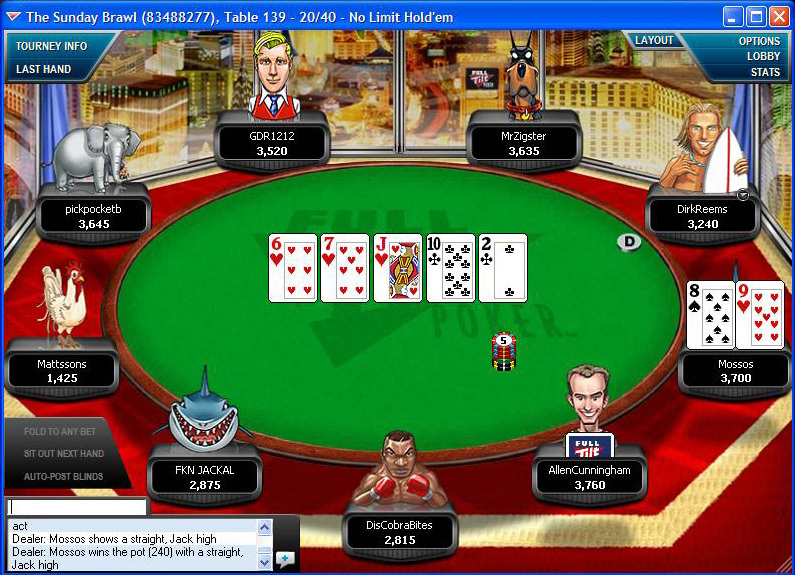 Full Tilt Poker was established in 2004. Since then, it has impressively grown, as new players join on daily basis to play in its many poker rooms. Full Tilt offers a variety of Poker games such as Texas Hold'em (No-Limit, Pot-Limit, Cap-Limit), Omaha (High and Low), Stud (High and Low), Razz and even an option to play a mixed game called H.O.R.S.E, where you play all the above games at the same table! Full Tilt offers you to play these various games in cash tables ranging from $0.01/$0.02 stakes and up to the highest stakes around such as $500/$1000. You can choose to play in tables of 6 or 9 players and even play heads-up in a table where you face only a single opponent. Deposit Options: echeck, MasterCard, Visa, Neteller, Moneybookers, InstaDebit, ClickandBuy, cash transfer and Click2Pay. Withdrawal Options: Visa, Check, Moneybookers, Click2Pay, InstaDebit, ClickandBuy. The support at Full Tilt Poker is highly qualified. E-mails are responded quickly and in a professional manner. The large support team will gladly answer any question that you might have and help you in any way. Full Tilt offers a lot of fun and entertaining tournaments. You can find so many different tournaments in Full Tilt Poker that it will take you some time to choose where you want to sit. Full Tilt Poker also offers weekly $3,000 freerolls. You join the freeroll tournements for free and the prizes are real, as you can win cash or even advance to much bigger tournaments with prizes as high as $2.5 million. You can also find yourself playing in a Shootout tournament, where in order to progress to the final table, you have to first eliminate all the players in your table. It's always challenging, fun and original. Another type of a great tournament is the Knockout Bounty tournament, where for every player you eliminate, you win and earn yourself some money, so the motivation here to win is even higher! It doesn't end here. You can choose to play in the Sit-N-Go (SNG) mini-tournaments that Full Tilt offers, that are maybe the best SNGs on-line. These are the tables where the game begins once a certain number of players take their seat. Moreover, only on Full Tilt Poker one can find the unique Matrix SNGs. Once you enter The Matrix, you will battle against 5 or 8 other players at four tables at the same time! The Matrix will take your poker skills to the limit. See if you can take out your opponents at four different tables at the same time and win some money... a lot of money! And there is more! Full Tilt allows you to test your skills and play in the special satellite tournaments, a victory in which guarantees you a seat at the World Poker Tour (WPT) or even the World Series of Poker (WSOP). Full Tilt Poker offers you a big signup bonus on-line with a 100% deposit bonus up to $600. So the more you play, the more you earn. Enter the Full Tilt Poker referral code and get up to $600 for free when making your first deposit. Full Tilt Poker has its Team Full Tilt. Some of the best professional poker players come to play at Full Tilt Poker, and you can chat, learn from and play with the pros. Just imagine yourself sitting at the same table with Phil Ivey, Chris "Jesus" Fergusson and Gus Hansen, trying to figure out what they're holding and trying to win some money from the best there are. On any given day you can find a table with pros like Mike Matusow, Patrik Antonius, Jennifer Harman, Phil Gordon, Erick Lindgren and many others. To find a room where a Team Full Tilt member plays simply look at the rooms list and join the ones colored in red. 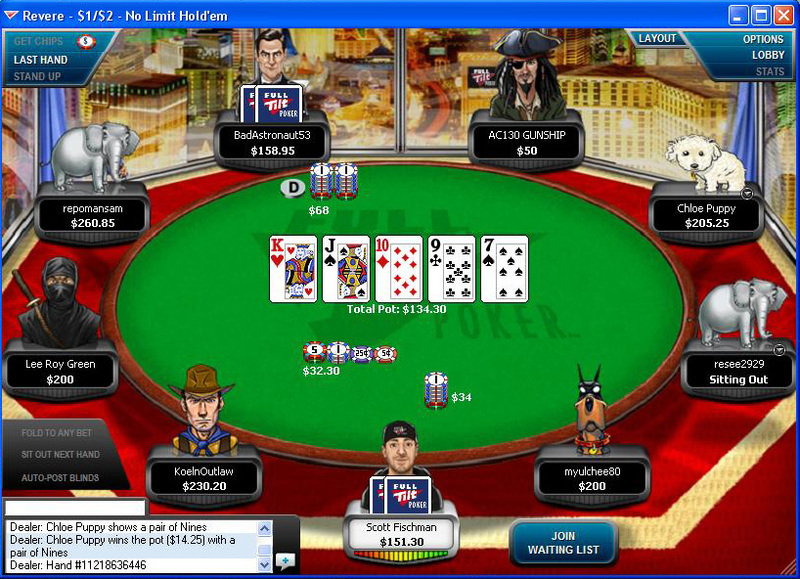 - Full Tilt Poker spoils you not only with poker money that you win, but also with Full Tilt Points (FTP). For each game you play, you earn points, and with these points you can enter various tournaments, games, and SNGs - but that's not all (see next feature). - Full Tilt Poker has a store and with enough points you can buy yourself clothing, books, DVDs, sports gear and even electronics. So on Full Tilt Poker you win both money and points that you can use anyway you like. - Another special feature is tournament points that you can earn and later convert them to real money. 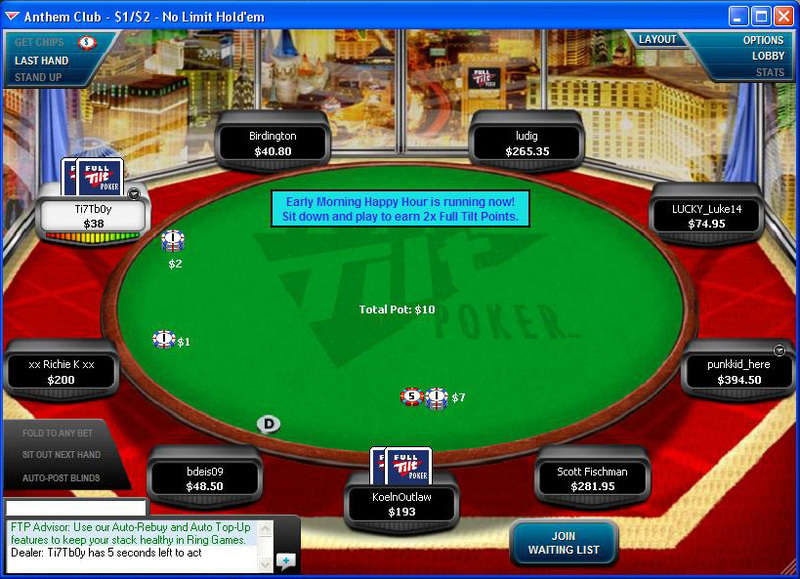 - Full Tilt Poker also has a Happy Hour feature. If you are playing during the Happy Hour, you double your FTPs, thus making your trip to the store more frequent. - Big Money Sundays. Play for your share of more than $1 Million in prize money in Sunday tournaments. - World Poker Tour (WPT) Qualifiers. Play to win a $12,000 prize package to one of the most important poker events. - Iron Man Challenge. This great feature allows you to win big prizes and also a chance to play three of Full Tilt Poker's pros heads-up for up to $100,000! 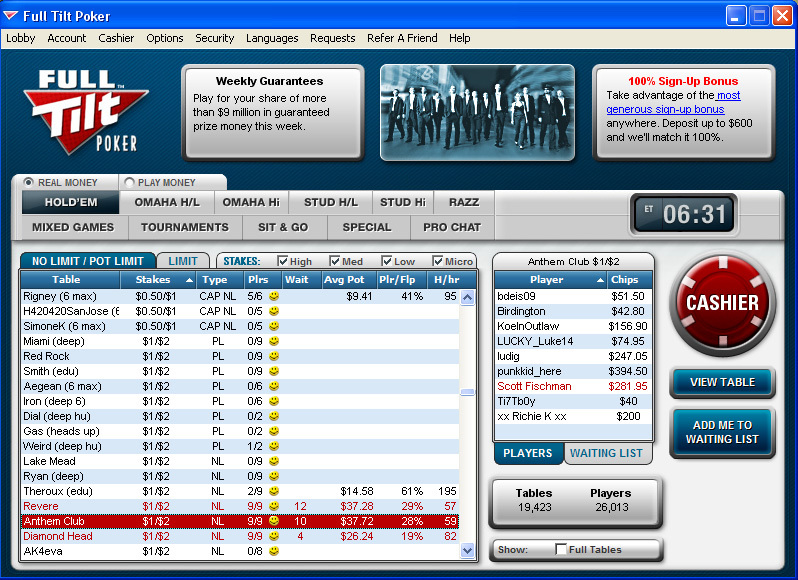 - Full Tilt Poker Leaderboards. The more you play, the more points you earn and the better your chance to be up on the leaderboard, which means getting great cash prizes and tournament buy-ins. - The Sunday Brawl. For each player you eliminate, you win cash in this $350,000 Knockout Bounty Tournament. - $200,000 Double Deuce. In this tournament, you can turn your $22 into a share of $200,000. The tournament is held on every Sunday and direct buy-in costs $22. There are also many Satellite tournaments with smaller entry fees, so you can enter this tournament in various ways. The Satellites buy-ins range from entering by Full Tilt Points to amounts of $1.30-$6.50. Just pick your preferred way and take your place in this great tournament. - The Doubles. Play the Daily Double tournaments to win your share of the Full Tilt Poker's progressive jackpot. - Bust-Out Bounties. Eliminate a Full Tilt Poker pro out of a tournament and take home extra cash and prizes. You can earn up to $200 for every pro you bust! - Chris Ferguson Challenge. Chris Ferguson is one of the most known professional poker players in the world. 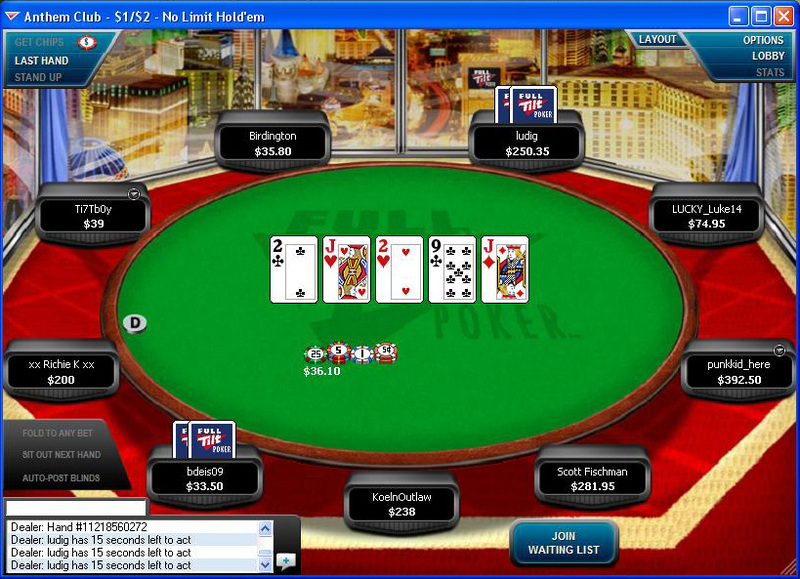 He started playing at Full Tilt Poker from nothing - a total of $0! He played freerolls until he earned enough to play games with real money buy-ins. In less than a year, Ferguson made $10,000 from his initial $0! Now you can also learn how to manage your bankroll properly and start winning money with this great feature. Check Chris Ferguson Challenge out and learn how you can turn good play and patience into thousands of dollars. See the best tennis players live as they compete and try to win the most important and prestigious tennis event of the year. Buy Wimbledon tickets 2011 today and secure your seats in the great stadiums with thousands of fans and people from all over the world and don't miss the thrill, excitement and the best tennis of the year. Expereince Grand Slam tennis live - an event every player dreams of winning.